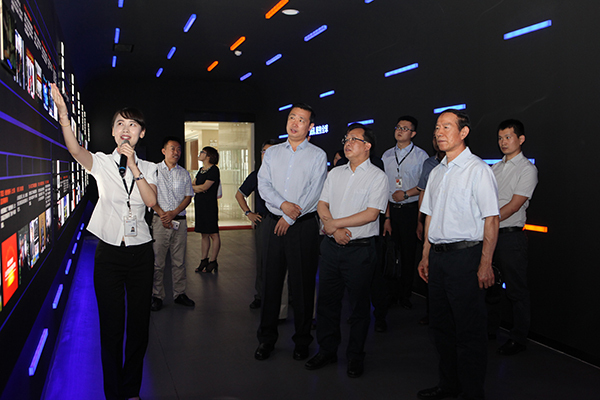 Director of NDRC Price Monitoring Center Lu Yanchun accompanied by Chen Chong, the director of Shandong Provincial Price Bureau and Secretary of Shandong Party Leadership Group, Shi Guangbo, the director of Zibo Municipal Price Bureau and Secretary of Zibo Party Leadership Group, and Wang Luyue, the director of Zibo Municipal Price Monitoring Center came to SCI Science & Technology Industrial Park for visit and guidance on June 28, 2017. 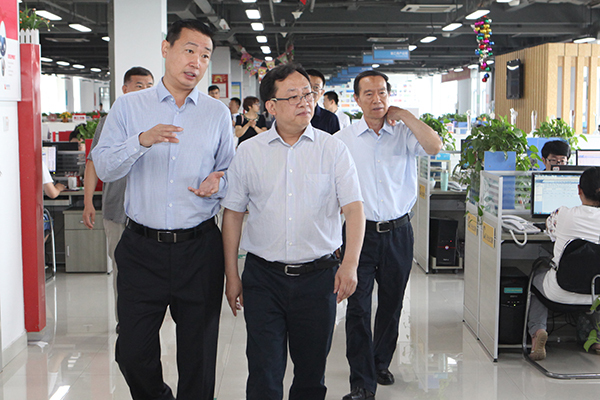 Director of NDRC Price Monitoring Center Lu Yanchun (in the middle) visited SCI exhibition hall. 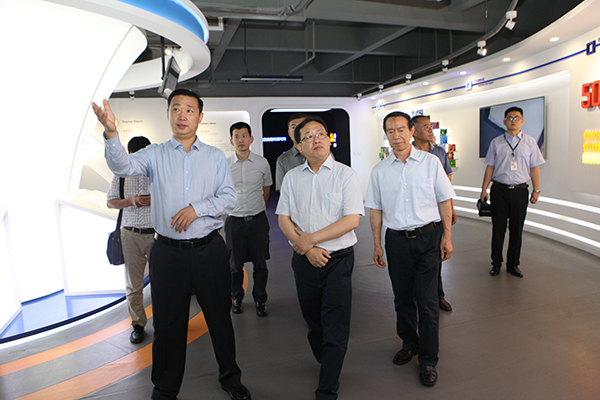 Lu Yanchun inspected SCI’s exhibition and office halls in succession, and expressed sincere appreciation for the achievements what SCI got in the field of bulk commodity after Jiang Hulin, SCI president, made a brief introduction regarding SCI’s development process, talent cultivation, the construction of information service platform and standardization system, etc. Jiang Hulin, SCI president, reported to Lu Yanchun for SCI’s talent cultivation, construction of information service platform, etc. Lu Yanchun visited the office hall. An in-depth conference communication relating to price monitoring and index exploring, etc. was in process. After the visit, Lu Yanchun had an in-depth communication with SCI relating to the price monitoring and index development, etc. At the beginning of the conference, Jiang Hulin extended his warm welcome to their visit and guidance. 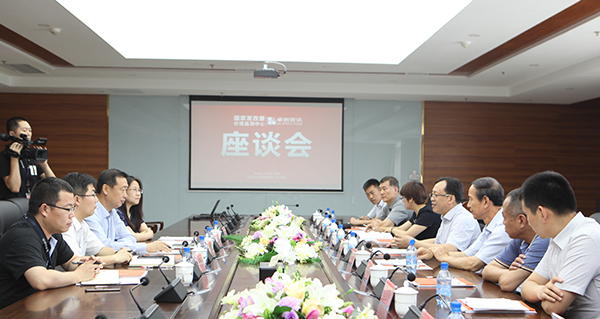 Lu Hua, SCI’s vice-general manager, introduced the cooperative projects between SCI and NDRC as well as SCI’s service mode. NDRC Price Monitoring Center and SCI jointly released “Price Monitoring Data Information in National Steel Market” in 2014. Since then, SCI had cooperated with NDRC Price Bureau, Price Monitoring Center in the field of price monitoring, index development, data analysis, macro control, industry structure and supply-side reform policy, among which there were 10 cooperative projects (including 9 index development projects). SCI would provide reliable and accurate data analyzed by a professional and deep method to make some efforts for innovating and improving the state regulation system, Lu Yanchun said. Lu Yanchun fully affirmed SCI’s efforts for facilitating price monitoring and government’s decision-making. He said, price analysis in essence was the interpretation of the economic conditions. With price reform and resource allocation marketization boosting deeply, comprehensive market analysis was one of the preconditions that was used to manage and regulate market. Only the most authentic price information could reflect the market anticipation objectively. Thus, we were able to make regulatory measures accordingly to guide the market in a rational way. SCI made a great many efforts which were significant and meaningful, yet we still had a large space to cooperate with each other for a long term. We hoped that SCI could provide more comprehensive, authentic, timely and rapid price data in our future cooperation as well as improve the analyzing ability and vitalize the history data. Meanwhile, we should continue to broaden our mind to seek more cooperative opportunities. During the conference, on behalf of SCI, Jiang Hulin extended sincere gratitude for the long-term attention, support and reliance from NDRC Price Monitoring Center and Provincial & Municipal Price Department. He added, the recognition from government and society encouraged and spurred us to forge ahead. And insisting on the principal of “neutrality, profession & concentration”, SCI would further spare no pains on price monitoring, index development and data statistics and analysis, etc. With more unswerving confidence and enthusiasm, SCI would go to great lengths to boost national macro control and industrial transformation and upgrading.